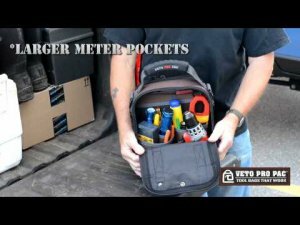 Veto Pro Pac has expanded their line of tool bags quite a bit over the last few years by moving into tech bags, pouches, and laptop bags. With their new Model MC tool bag they are taking a step back to their initial contractor series design, but have gone smaller. The Model LC is actually a lot bigger than you would expect and holds a ton of tools, so I am not surprised to see Veto Pro Pac come out with the smaller Model MC. In fact, I found the LC to have more room than I usually needed, which meant I was filling it up with tools I rarely used. The Veto Pro Pac Model MC can hold plenty of hand tool on its front side and is still large enough to handle a drill and other larger hand tools and meters on the back side. It really is just a smaller version of their popular Contractor Series tool bags.